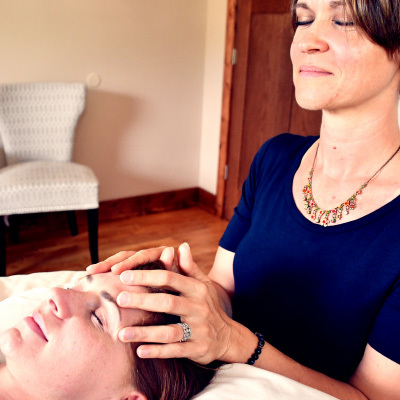 CranioSacral Therapy is a gentle, light touch, hands-on approach to balance the Cerebraspinal fluid (CSF) surrounding the brain and spinal cord. This approach has been life-changing for me personally. I was diagnosed at 15 years of age with scoliosis in my low back and lived with chronic sciatic pain for years. I’ve had amazing results and strides in my own physical, mental and emotional balance due to having CranioSacral therapy myself! CranioSacral work differs from chiropractic and massage because it is treating from the inside out instead of receiving force from the outside in. On many occasions, my body could not take the force and pressure of massage and chiropractic. I needed something more gentle, a way for my body to release and unwind without being “made” to move. When the body is not afraid, it can relax and release naturally. CranioSacral is a hands-on therapy that uses light pressure to manipulate the Dura Mater (the waterproof barrier that surrounds the brain and spinal cord) to enhance the production, circulation, and reabsorption of the CSF around your brain and spinal cord. As the production and reabsorption of the Cerebrospinal Fluid is contained in a closed hydraulic system within your body, there is a normal rise and fall of pressure which occurs. The Dura Mater plays an important role in cranial bone movement. Yes, that’s right! Research shows that our cranial bones move in a rhythm, known as the craniosacral rhythm, instead of being immobile as previously thought. The bones in the skull are movable, and when there is restriction and compression in these joints, the fluids in the cerebral spinal fluid do not move as well. Diminished movement of your bony structures in an area of your body, indicates a malfunction that your body is not correcting on its own, and will need to be addressed. The Central Nervous System is also contained within the craniosacral system. So what does this mean? Your central nervous system controls your entire body. This is the part that controls if you are relaxing and digesting your food or if you are in fight or flight mode. Your body can easily get unbalanced if it is not able to accommodate pressure changes (due to bony compressions, spinal misalignments, birth trauma, etc.) this will lead to dysfunction, pain, and other physical and mental disturbances. Few body structures have more influence over your health and well-being than your Central Nervous System, so being able to manipulate this system provides immeasurable benefits to your overall health. Situations that we encounter that put force into the body could be from car accidents, falls, birth traumas, surgeries, extensive dental work, etc. These experiences can leave a pain or dysfunction “calling card”. Animals shake when they go from one situation to the next; however, we were never trained to shake off the excessive energy. More often, when we experience trauma, we shrink down into a pain pose and hope no one saw us fall. Embarrassed, we can carry the trauma and emotional scar, related to that particular incident, within the tissue that was affected, for years. Additionally, if any damage occurred that needed intervention, we may have relied on crutches or were stuck in a bed or recliner while we healed. This type of recovery makes tissues shorten and ultimately set in new dysfunctional patterns. CranioSacral can be used to release the roots of these dysfunctions in order to soften the nerve roots and give more fluid exchange and hydration to the area that has been sitting quiet and unused for awhile. The beauty of this work is… it’s never too late! You can release old traumas and dysfunctions that occurred as early in your life as childbirth. For example, if you were stuck on your mother’s pelvis, this put pressure on your cranial bones. I treat many people who realize that, after we start to release these bones in the skull, they did in fact have traumas as a child they were previously unaware of. Mahatma Gandhi said “in a gentle way, each of us have the capacity to shake the world.” I believe that, in the same gentle way, I can help to encourage healing and wellness for my patients. My own experience with CranioSacral Therapy has demonstrated the validity of this non-forceful and effective form of treatment.